December 2017, news broke and fans of 畢奇 Pucky had teased an upcoming art collectable toy HERE named “Pool Babies”. Fast forward to 2018 present day and our predictions came true! Pool Babies already looks promising with the innocent eyes and colourful Pucky colour palette. 2018 should be another smash hit for Pucky, in art collectables as well as her fantastic art and now with the much anticipated blind box mini series with a range of Pucky characters. Based on the dream forest world Pucky created. With the end of the winter, the lake of ice is melting, and the elves in the dream forest wake up from a long dream of hibernation. 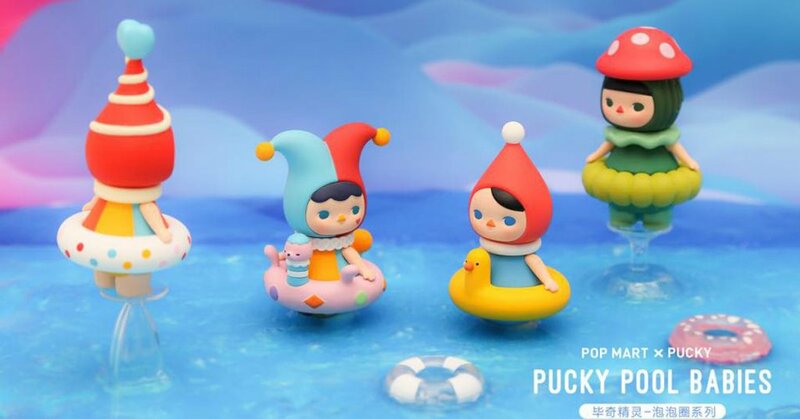 With Shanghai Toy Show around the corner, we would guess POP MART would be debuting “Pool Babies”. We have also heard April 14th POP MART will have them in stock for non STS attendees. Hopefully, Pool Babies will be easier to get hold of compared to some of Pucky’s releases of 2017. Stay tuned for international release details.